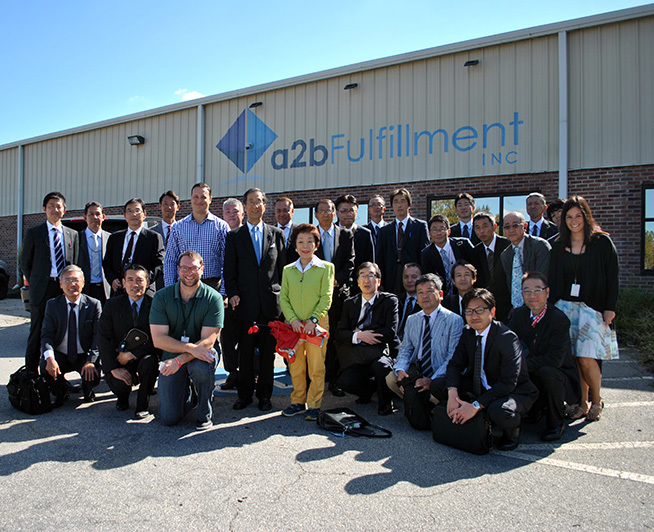 On October 17th, a2b Fulfillment hosted 27 delegates from The Japan Warehousing Association (JWA) at its corporate headquarters in Greensboro, Ga. The visit was part of a formal study tour to the United States that included stops in both Atlanta, Ga. and Seattle, Wa. The JWA selected a2b as one of only a handful of third-party logistics providers to visit during its tour of the States. 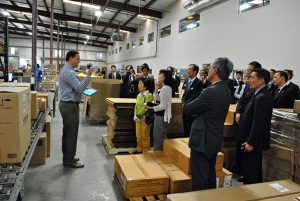 With the aid of a translator, Latz provided a tour covering all aspects of a2b operations; including an overview of a2b’s specialized technology, advanced fulfillment processes and multi-channel customer care contact center. Founded in 1948, the JWA represents logistics and warehousing professionals in Japan. The group is under the control of the Ministry of Land, Infrastructure, Transport and Tourism and it provides research, warehousing best practices and regulation education for its members. Prior to departure, the group was treated to some local, southern cuisine at The Yesterday Café, including the establishment’s famous buttermilk pie. JWA President Yoichi Tanaka presented a gift to Latz on behalf of the group. “It was an exciting opportunity for both sides to ask questions and learn from one another. I hope to have the opportunity to meet with the JWA and its members again, perhaps next time in Japan,” says Latz. Director of Marketing, a2b Fulfillment, Inc.
Share this content with your network!